Acworth is surrounded by two beautiful lakes (Lake Acworth and Lake Allatoona), which offer beaches for swimming, fishing, boating and camping opportunities. 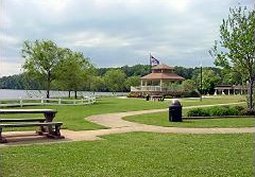 There are twelve parks that surround Acworth for picnicking. Nestled along the banks of Lake Acworth is Cobblestone Golf Course, which was recently rated the #1 public course in Georgia by Golf Digest. Whether the golf related outing is a company tournament, class or family reunion, Cobblestone is the perfect choice. Acworth Apartment search conducted free and we email you the results along with available pictures, floor plans and maps to the properties. Acworth Apartment Rentals offers the largest apartment selection with relocation services and extensive knowledge of property management in Acworth. Leasing an apartment in Acworth is quick and simple with our Free Acworth Apartment Locating Services. All you do is contact us below at Apartments Acworth and complete our email request form. You will be contacted by a relocation specialist to confirm your information. Easy as 1,2,3!